If I were to describe the lifestyle in Denver, Colorado to you, I would begin by mentioning we live at altitude (5280 ft of highness), we live in a very dry climate with hot sun and cold snow (if you leave a loaf of bread out on the counter it will be a cracker by nightfall). We live under an almost constant canopy of bright blue skies (even in the winter). As a whole, the people of Denver get outside often (except when a Broncos football game is on the TV). We have endless adventure sports in this state and are known to have one of the healthiest populations in the United States. We also have some of the most incredible breweries and coffee shops in this great nation; encouraging us to visit other neighborhoods outside our immediate surroundings. There is certainly no shortage of coffee shops in Denver, within three miles of my house, I count over twenty coffee shops (not including Starbucks). So when I decided, for a seven-week period in October and November, to take on Chasing Mailboxes 7-week 7-coffee shop 2014 Coffeeneuring Challenge, the problem was not finding a coffee shop, it was deciding which coffee shop to bike to. The point of this coffeeneuring challenge is to explore and add variety to my weekend. The challenge is about the bike culture lifestyle. One rule of coffeeneuring is that the ride not be part of a formal training ride. For me it offers the perfect excuse not to attend (to photograph) two cyclocross races on any given weekend. "No I am not going to the race tomorrow..." I am going to a coffee shop, to yoga class, doing home repair, reading, riding my own bike, going to a museum, the gardens, taking my dog for a hike, meeting a friend for breakfast - all those "get a life" activities that I love so much. Address: 1730 E Evans Ave.
Now that World Championships Road and Il Lombardio are over, the professional cycling season is in its official lull period. Other than news of rider transfers, I find myself totally ignoring twitter and other cycling news sources. For the next three months my cycling interests focus mostly upon local cyclo-cross races and trying to reestablish a method of continuing my own exercise as the cold winter months approach. I was happy to begin this Coffeeneuring Challenge by visiting one of the best truly true coffee places in Denver. Kaladi Brothers Coffee shop is often filled with young laptop focused students, or tables of old professors gathered around a tiny table conducting what looks like that old art form called conversation. Kaladi's make coffee that tastes like someone just roasted and ground the bean in the past 5-minutes. Preceding this strong delicious coffee was a visit to meet a friend at Illegal Petes, just a few storefronts down from the coffee shop. When nearby University of Denver is in full swing, a flood of college students swarm into both Kaladi's and Illegal Pete's to cure their Sunday morning hangovers. They sit recovering, six to a booth, shoveling in large breakfast burritos. College students are known to root out good sources of plentiful, tasty and cheap eats. Living near a university definitely has its advantages, including looking forward to the soon to open Fermentra brewery located across the street from both Kaladi Brothers Coffee and Illegal Petes on Evans Ave. near DU. I am thinking of doing a beeraneuring in the spring. 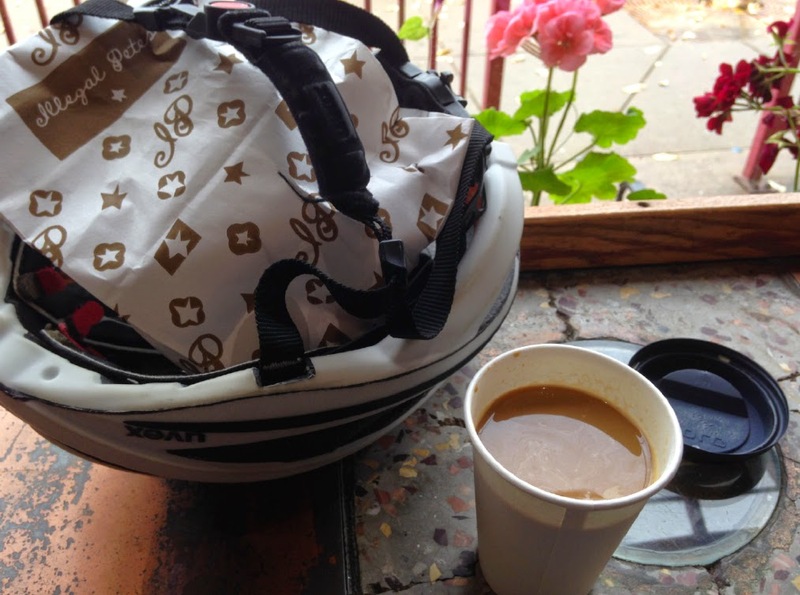 A bike helmet, half a (too big for me to eat in one sitting) breakfast burrito and an Americano coffee - perfect. 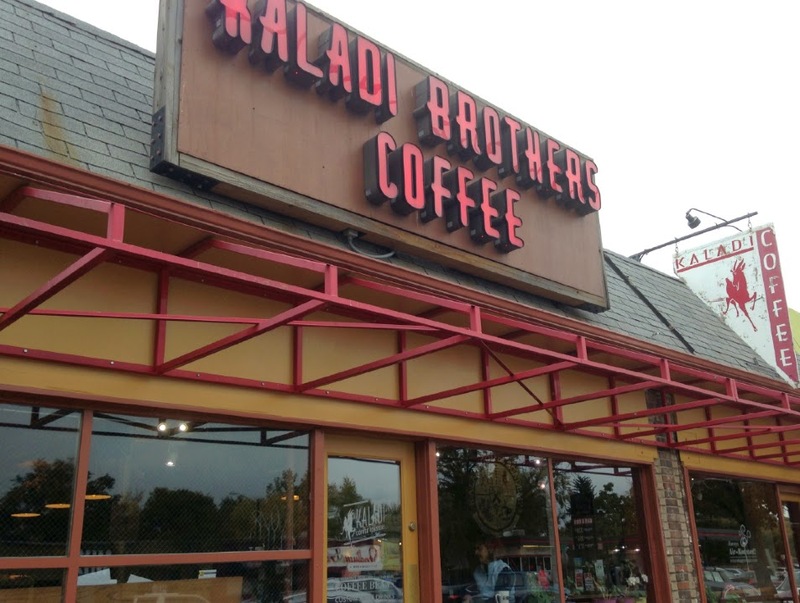 The smells inside Kaladi Brothers Coffee shop are amazing! Join the Coffeeneauring Challenge: Read the rules. The Challenge ends November 16th. There are six weeks remaining, you must ride to seven different coffee shops (rain, snow or shine). 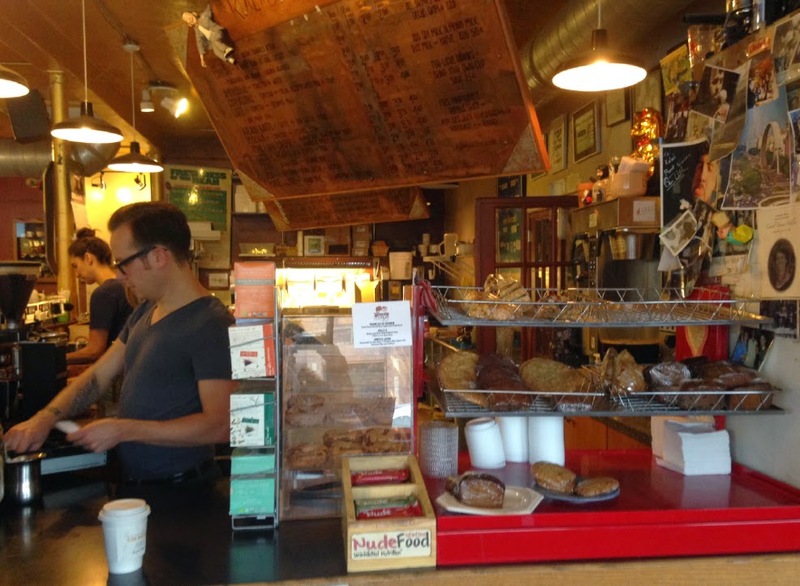 #coffeeneuring on Twitter Coffeeneurs Facebook or the Coffeeneuring group on flickr. Stay tuned for my next six recommended coffee shops near Denver, Colorado.